raise your hand if you run around like a crazy person while getting ready in the morning? we can't all be Holly Golightly and brush our eyebrows and apply eyeliner while casually strolling around our apartment looking for a lost shoe. it's more like running up the stairs to shower, down the stairs to feed the kids/make lunches, up the stairs to dress and makeup, down the hall to check that all three children are dressed as well etc. you get the picture. anything that can get me out the door faster with minimal effort is immediately added to my routine. 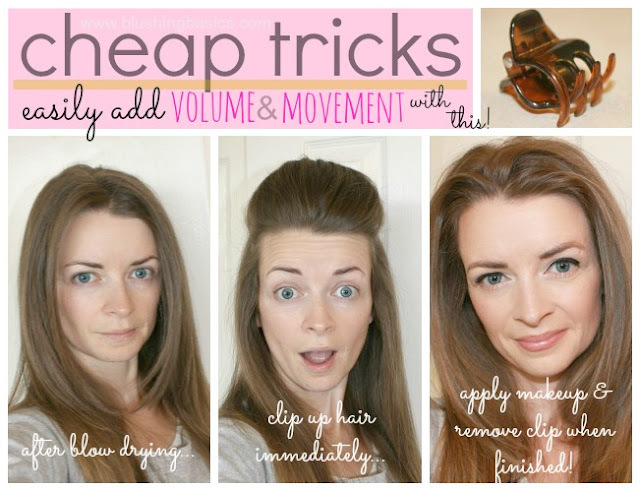 lately i have been sporting this quick tip shown above and decided to put together a series of what i like to call 'cheap tricks'. cheap tricks are makeup/hair/beauty/fashion tips to make life a little easier. do i have time to tease my hair for volume every day? no. but i do have the extra 30 seconds and an inexpensive little claw clip to pin my hair in place for the 10-15 minutes i use to apply makeup and get dressed. before walking out the door i remove the clip and my hair has the added volume and movement of a professional blowout. worth the added minimal effort for maximum payoff. This is a really good idea, Kristie! I haven't ever thought of using one for that purpose but it makes a lot of sense! wow i love it. such a nice result. you have gorgeous hair. Great tip! It seems every morning is a rush to get lunches made and get out of the house on time. Any idea that can get me an extra 5 minutes in the morning I'm all for.